Research Emphases Taxonomy and biogeography of Orchidaceae and Rubiaceae of Africa with Bonaventure Sonké (Université de Yaoundé I, Cameroon) and Vincent Droissart (IRD, France). Description of new taxa (with D. Geerinck, P.J. Cribb, V. Droissart & B. Sonké); revisions of selected genera: Chamaengis (with V. Droissart & B. Sonké), Angraecum (with V. Droissart), Ancistrorhynchus (with D. Geerinck). Phylogenetic study of the angraecoid orchids (with Gregory M. Plunkett, NYBG and Claire Micheneau ULB). Ex situ and in situ conservation of orchids (with V. Droissart, B. Sonké, M. Simo) and endemic African plants (with Gretchen Walters, IUCN and Steven Dessein, BR). Diversity of the African forests with Olivier Hardy (ULB, Belgium). Development of the IUCN Red Listing in Central Africa with Steven Dessein (BR), David KenFack (SI) and Roy Gereau (MBG). Flora of Gabon: inventory in the Massif du Chaillu, Waka National Park and Monts de Cristal; identification of new protected areas (with Gretchen Walters (IUCN). Sao Tome and Principe: Catalogue of the endemic Vascular Plants (with G. Joffroy, E. Figeiredo & F. do Oliveira). West Central Africa: biogeography of inselbergs (with I. Parmentier); ecology of epiphytes on inselbergs in relation with surrounding forests. Selected Publications Droissart V., Sonké B., Lowry II P.P., Stévart T. (in press) Notes taxonomiques et chorologiques sur les Orchidaceae endémiques d’Afrique centrale atlantique. Adansonia. Lachenaud O., Droissart V., Dessein S., Stévart T., Simo M., Lemaire B., Taedoumg H., Sonké B. 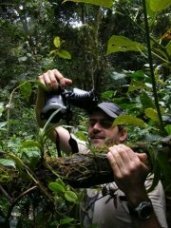 (in press) New records for the flora of Cameroon, including a new species of Psychotria (Rubiaceae). Plant Ecology and Evolution. Droissart V., Hardy O.J., Sonké B., Dahdouh-Guebas F. & Stévart T. 2011. Heterogeneous Sampling to Assess Geographic Diversity Gradients? A Case-Study with Orchidaceae and Rubiaceae in Cameroon. Biotropica. Droissart V., Sonké B., Hardy O.J., Simo M., Taedoumg H., Nguembou K.C., Stévart T. (2011) Do plant families with contrasting functional traits show similar patterns of endemism in Central Africa? Biodiversity and Conservation. 20: 1507-1531. Figueiredo E., Paiva J., Stévart T., Oliveira F. & Smith G.F. 2011. An annotated catalogue of the flowering plants of São Tomé et Príncipe. Bothalia 41: 41-82 (2011). Janssens S.B., Fischer E., Stévart T. 2010. New insights on the origin of epiphytic Impatiens (Balsaminaceae) in West Central Africa based on molecular phylogenetic analysis. Taxon. 59(5): 1508-1518. Droissart V., Lowry P.P., Bosser J., Roberts D.L. & Stévart T. 2010. Correcting confusion regarding the identity, circumscription and synonymy of Angraecum gracile Thouars (Orchidaceae). Taxon, 59(5): 1578-1580. Stévart T., Cawoy V., Damen T. & Droissart V. 2010. Taxonomy of West Central African orchid (1): A new Angraecum sect. Pectinaria (Benth.) Schltr. (Orchidaceae) from Gabon and Equatorial Guinea. Systematic Botany. 35(2): 252-256. Stévart T., Delepierre G., Lebel J.P. & Geerinck G. 2010. Les Orchidaceae du Parc National de Nyungwe (Rwanda). In X. van der Burgt, J. van der Maesen & J.-M. Onana (eds). Sytématique et Conservation des plantes africaines. Royal Botanic Gardens, Kew. Proceeding du XVIIIème congrès de l’AETFAT, Yaoundé, Cameroun, 91-100. Simo M., Droissart V., Sonké B. & Stévart T. 2009. The Orchid Flora of the Mbam Minkom Hills (Yaounde, Cameroon). Belgian Journal of Botany, 142(2): 111-123. Nguembou K. C., Ewedje E.-E. B. K., Droissart V., Stévart T. & Sonké B. 2009. Une espèce nouvelle de Bertiera (sous-genre Bertierella, Rubiaceae) d’Afrique centrale atlantique. Adansonia 31 (2): 397-406. Droissart, V., Sonké, B., Djuikouo, M.N., Nguembou, C., Parmentier, I. & Stévart T. 2009. Synopsis of the genus Chamaeangis (Orchidaceae) with two new taxa. Systematic Botany, 34(2): 285-296. Droissart V., Simo M., Sonké B., Cawoy V. & Stévart T. 2009. Le genre Stolzia (Orchidaceae) en Afrique centrale avec deux nouveaux taxons. Adansonia, sér. 3, 31 (1): 25-40. Droissart V., Sonké B., Simo M. & Stévart T. 2009. New orchid records from West Central Africa. Edinburgh Journal of Botany 66(1): 115-132. Dauby G., Parmentier I. & Stévart T. 2008. A new species of Afrothismia (Burmanniaceae) from Gabon, Nordic Journal of Botany 25: 268-271. Dauby G., Leal M. & Stévart T. 2008. Vascular plant checklist of the Pongara National Park, Gabon, Syst. Geogr. Pl. 78: 155-216. Stévart T., Parmentier I. & Droissart V. 2007. Deux espèces nouvelles de Polystachya (Orchidaceae) de Guinée Equatoriale. Adansonia, 29(1): 31-38. Droissart V., Sonké B. & Stévart T. 2006. Les Orchidaceae endémiques d’Afrique centrale atlantique présentes au Cameroun. Syst. Geogr. Pl. 76: 3-84. Stévart T., Ngok Banak L. & Sosef M. 2006. Synthèse des inventaires réalisés sur les Orchidaceae dans le cadre du Projet d'Evaluation des Aires Protégées du Gabon. In S.A. Ghazanfar & H.J. Beentje (eds.). Taxonomy and ecology of African Plants: their conservation and sustainable use. Proceedings du XVIIème Congrès de l'Aetfat, Royal Botanic Gardens Kew: 651-665. Sosef M.S.M., Wieringa J.J., Jongkind C.C.H., Achoundong G., Azizet Issembé Y., Bedigian D., van den Berg R.G., Breteler F.J., Cheek M., Degreef J., Faden R., Gereau R.E., Goldblatt P., van der Maesen L.J.G., Ngok Banak L., Niangadouma R., Nzabi T., Nziengui B., Rogers Z.S., Stévart T., Taylor C.M., van Valkenburg J.L.C.H., Walters G. & J.J.F.E. de Wilde. 2006. Check-list des plantes vasculaires du Gabon/ Checklist of Gabonese vascular plants. Scripta Botanica Belgica, 35, 438p. Stévart T. & Droissart V. 2006. Diversité des Orchidaceae du complexe de Gamba (Gabon). In: Alonso A., Campbell P. & Dallmeier F. (éds.). Gabon: Biodiversité d'une Forêt Equatoriale Africaine. Bull. Biol. Soc. Washington, 12: 53-64, 275-284.